The car comparison displays simultaneously up to three new cars with their photos, dimensions of length, width and height and boot capacity. Compare dimensions between different models of the same make and similar automobiles of different makes, both new cars and recent models. 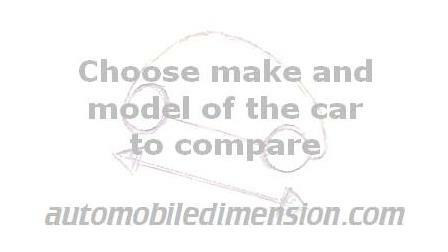 Choose make and model of cars to compare and modify your selection whenever you want. the car comparator will list here the automobiles of similar size. Change the first vehicle and the list will be recalculated automatically. After choosing the models to compare, their dimensions are graphed here. The list of models to choose for each make is sorted by the length of the vehicles. Next to the name of the model, the car size comparison shows you the year of change of the external dimensions of the vehicle independently that, after this date, have come to market new versions with updated features, equipment or engines. You may also follow this link to compare small cars. Discover which automobiles of any make are similar-sized to the model you choose in its three dimensions of length, width and height. The search engine sorts new vehicles of any make by the dimensions of length, width and height you specify. Compare small cars, SUVs, luxury cars, etc. Simulation of the space occupied by the dimensions of a car parked in its parking. Select make and model and the measurements of the parking space.